Chatting to the antique shop owners, taxi drivers and hotel staff, I discover that the small business owners in Lourdes are not happy this year. Two years of flooding have apparently had an effect on the number of visitors, and the locals are all saying how quiet it is. It is fashionable to decry the “commercialism” of Lourdes. I have never gone along with this. Bluewater is commercial: it sells over-priced clothing and luxury goods. At Lourdes, the shops are filled with rosaries, holy water bottles, and statues. People have to pay the rent and feed their families: how pleasant to see a micro-economy based on the sale of devotional items to pilgrims, rather than superfluous tat for people with more money than sense. On previous visits, I have always encouraged pilgrims to visit the official shop within the Domaine. After taking a look round myself this afternoon, I am now not so sure. There is something suspiciously preachy about the guide books and devotional items there, as though the authorities want to draw people away from their robust and straightforward faith, and their naïve love of the beautiful, and direct them to a more respectably Rahnerian contemplation of the analysis of the human experience, and selected themes from Gaudium et Spes. These are reinforced by pedantically scriptural chants repeated in five or more languages making the official devotions similar to the Monty Python sketch of the inauguration of a postbox for the new common market era. 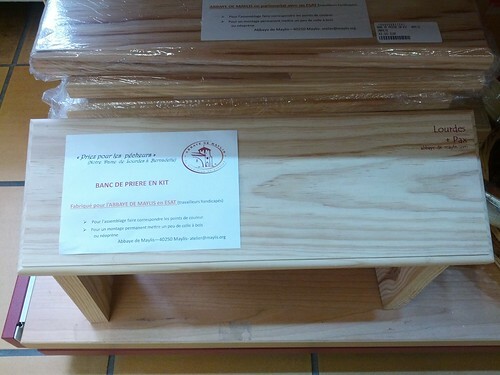 In the official shop, I was amused by this self-assembly Taizé prayer stool for the discerning solitaire. The fact of its being made by travailleurs handicappés is a worthy selling-point. I only hope they remembered to source the wood from sustainable forests. 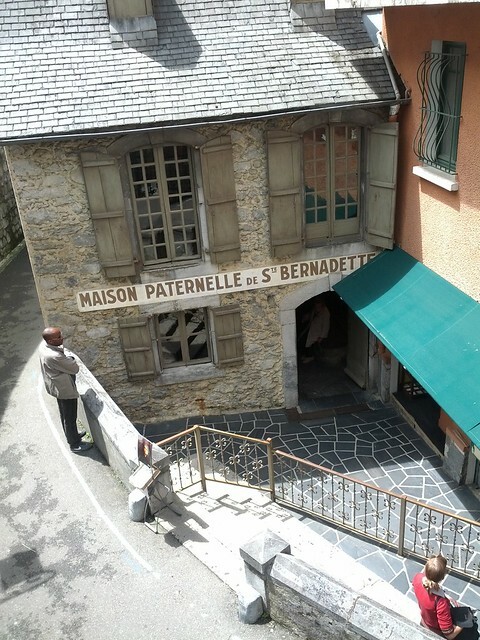 One place I do encourage you to visit is the Maison Paternelle de Ste Bernadette. This is the house where St Bernadette’s family made their farewells when she joined the convent. It does not feature on the official tour “In the Footsteps of Bernadette.” The reason given is that a charged is made to enter (2 euro.) The house is owned by the Soubirous family and I get the impression that no love is lost between them and the shrine authorities. The small museum has photos, family items and furniture that are not seen elsewhere and seem to be airbrushed out of official accounts.